We love these curtains. Very durable and effective! Awesome price for the quality of Materials used to make this curtains. Keep light out and heat in with this Eclipse Arno Thermalayer blackout window curtain panel. A subtle trellis pattern elevates your window treatment, and metal grommets allow for easy hanging. Dimensions 84.0 In. X 52.0 In. I ordered this curtains for our master bedroom the color of grey and I love it! The material is soft and it’s not really 100% blackout but good enough to darken the room in the daytime. The atmosphere of our room has been totally changed. My husband likes it too. I’m so happy that I chose this curtain! I ordered these in grey, and they are quite dark. Also, I was surprised that the different colors were screened on, they are not separate pieces of fabric sewn together, which would be more expensive looking. These are going back. I could not be happier with these curtains! Beautiful color and great quality. Beautiful drapes. In ordered in the gray and I'm very pleased. I ordered 2 pair and it was just enough to look full and this window faces the morning sun and they block the rays well. No ironing required hung them up right out the package. These are great curtains, I have them in my living room where the sun hit when it is going down. These curtains do a great job of keeping out the majority of the light. Maybe I missed it, but I was pretty certain this curtain came as a set. It doesn't. How disappointed was I when I got the delivery and there were only 2 panels? I have 2 windows. Not worth the double expense. Had you return blue curtains, color was dull and didn't work for my room. They keep the sun out! Nice colors too! 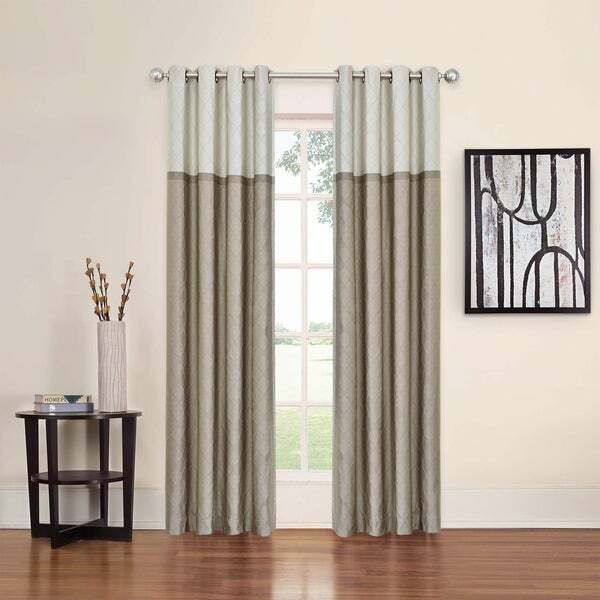 Beautiful curtains and they are a great find at a great price. My daughter absolutely loves them for her new apartment. Does the job on room darkening, very nice drapes for the price. Very nice, keeps upstairs cooler. "Hi, I'm not seeing some important info in the listing: what width is the panel? is the lining white/light colored or does it match the front of the curtain? is the curtain machine washable? What color is the grommet? and, finally, which size rod will work with it? Thank you for the information!" The width of the panel is 52 inches. The panel has a white lining. We recommend machine washing the panel in a cold gentle wash and hang to dry. The grommet color is an oil-rubbed bronze, and a 1 inch rod is recommended. "The one listed as blue looks green. What color is it really?" They look slate blue on another site. "Is the top of the taupe drape a cream color"
Yes, I would describe the top of the taupe option as a cream color. Mine have the grey top and the darker grey bottom. "How many panels are in each package?" There are 2 panels in each package. "What is the width of this panel?"